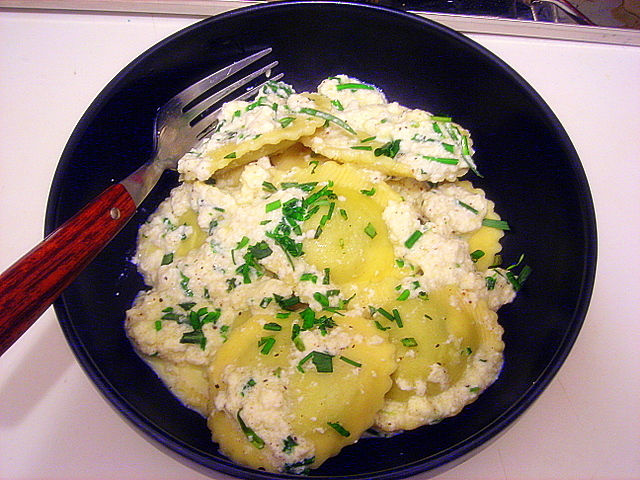 Today’s lunch is a riff on a Florentine specialty, ravioli con ricotta e spinaci (ravioli with ricotta and spinach). I don’t have enough space in my kitchen to make my own pasta so I cheated by buying some ready-made ravioli from Citarella. Make the sauce while the pasta cooks. Melt butter over medium heat. Add half and half. Whisk in ricotta and cook for 4-5 minutes. Check seasoning. Fold in herbs. Reserve a bit for garnish. Drain ravioli and place in saute pan. Toss. Transfer to a warmed serving dish, sprinkle with remaining herbs and serve immediately. 09 Mar	This entry was published on March 9, 2008 at 12:30 am and is filed under food, general. Bookmark the permalink. Follow any comments here with the RSS feed for this post. It looks divine. I love Italian food. We have a really nice northern Italian Trattoria in my neighborhood. I don’t think there is single dish served in the place that features tomato sauce.